* ... ANCHOR AWAY: Longtime KBAK/KBFX Eyewitness News anchor Lisa Krch has reportedly been let go by the CBS and Fox affiliates. Krch arrived in 1997 from Chico/Redding as morning anchor and later moved to the prime evening anchor slot. This latest talent change is one of many that news director Cristi Jesse has made since arriving at the duopoly last year. * ... WESTPARK: If you haven't read the column by Lois Henry on why Caltrans is insisting on plowing through the Westpark neighborhood to extend Highway 58, I recommend you do so. It is amazing to me that we would opt to destroy several hundred single-family homes and permanently divide a neighborhood just to save a couple of parks, which could easily be relocated and replaced. * ... CALIFORNIA: There is little doubt that California economy is improving, but how you feel about that depends on where you live. Coastal areas are rebounding nicely, but the Central Valley and other inland areas are still struggling. According to a New York Times analysis, the Bakersfield metro area has a jobless rate of 13.4 percent compared to 7.7 percent in Santa Barbara and 7.9 percent in San Francisco. Fresno's unemployment rate came in at 14.9 percent, which the state average held at just over 10 percent. * ... WHAT RECESSION? Our jobless rate may be stubbornly high, but it hasn't stopped us from enjoying our favorite restaurants. I was out Saturday night and tried - unsuccessfully - to get a seat at both K.C. Steakhouse and Enso downtown, both of them doing booming businesses. We ended up squeezing in at Muertos in the Wall Street alley, but it's good to see the local eateries seems to be doing well. * ... HOT MARKET: And if you don't think the local housing market is heating up, consider this: A friend who works at Trader Joe's is being transferred and listed his house the day before Thanksgiving. By the Friday after Thanksgiving, he had five offers on his house and seven scheduled showings the next day. His listing agent: Laurie McCarty of Coldwell Banker. * ... CHRISTMAS NEEDS: The Centennial Medical Group has collected supplies for our troops overseas but is having trouble finding someone to help box them and ship them abroad. If you can help, contact Joanne Pearce at (661) 326-8989. * ... DID YOU KNOW? 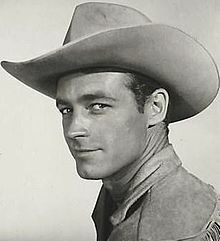 Did you know that Guy Madison, the Hollywood star who played a starring role in "The Adventures of Wild Bill Hickok" in the 1950s, was from Bakersfield? He was born in Pumpkin Center and went to both East High School and Bakersfield College before heading off to Hollywood. He was married briefly to the actress Gail Russell and died in 1966.